I think this bird is one of the coolest looking aircraft ever designed. It could have been featured in the movie "Dune". The following articles are from Flight Magazine. power plant arrangements n o v e l .
and for wishing " to know all about it." rrue picture of what the Do. X is, and what it really means. items as dimensions and areas, weight, performance, etc. return once more to the subject of the Do. X.
of December 16' and 23, 1920.
and they must have caused the machine to be very " dirty "
wing lift struts were anchored to the tips of the stumps. which has now culminated in the production of the Do. X. 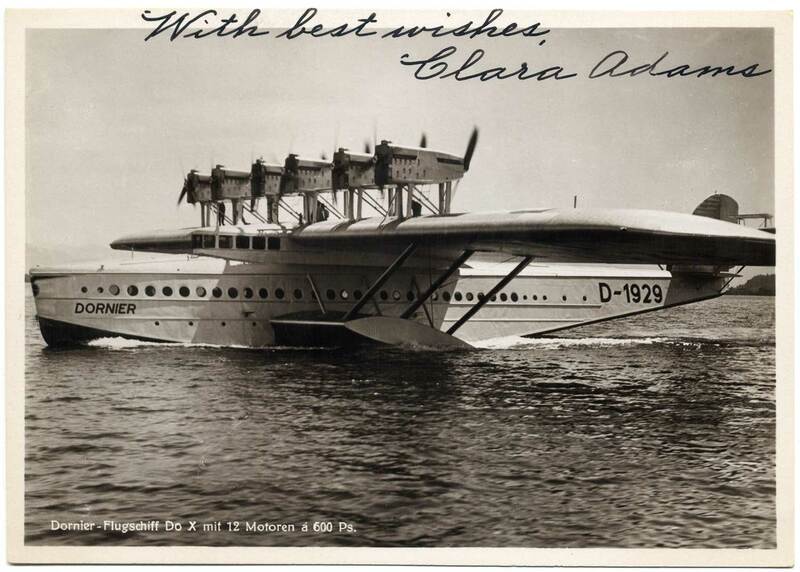 28 types (not all flying-boats). flight was made on July 12, 1929.
serving to steady the engine mountings laterally. lbs.,'h.p. The " wing power " in that case is 12 -33 h.p./sq. m.
V-form, to terminate finally in a straight raked stem. empty is 0 -8 m. (2 ft. 8 in.). At a gross weight of 50 metric. 29-9 kg./cu. m. (1-85 lb./cu. ft.). the bottom to squares of about 0-63 sq. m.2 (6-8 sq. ft.). chief engineer's control station, wireless room and so forth. 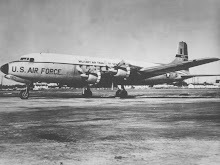 of the wing, and have consequently no windows on the sides. They extend aft as far as the trailing edge of the wing. and more resembling the lay-out on board a surface vessel. 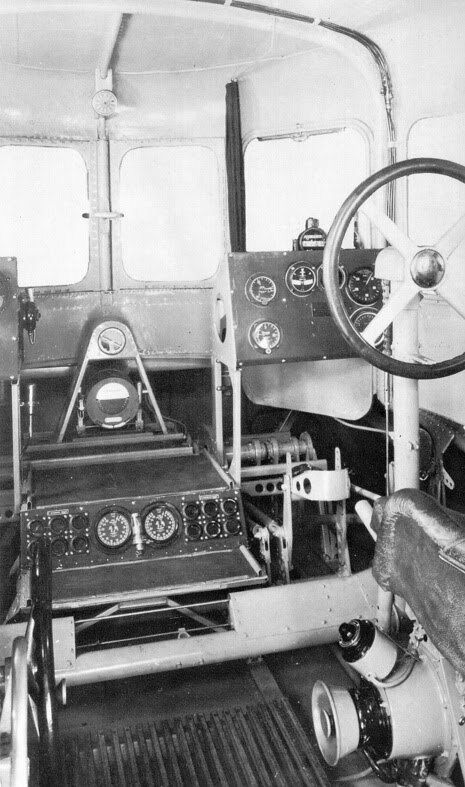 over which the machine is to be operated. watertight compartments finishing at the main deck. be reached for inspection by a man crawling about inside.
" give " to any extra loads. surfaces acting as balances. The tail is of " sesquiplane " type in that there is a small tail plane resting direct on the stern portion of the hull, and a main tail plane higher up, braced to the lower and to the hull by struts. The rudder balances take the form of vertical surfaces placed between the top and bottom tail planes, as distinct from the horn balance or servo rudder used on large British flying-boats. ' The operation of the control surfaces is by steel rods, or tubes, suspended on pendulum cranks. Ballbearings are used throughout. 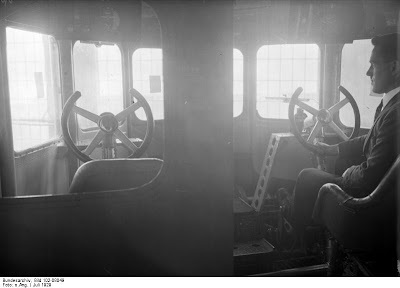 Trimming of elevators and rudder is achieved by a setting of the separate balance surfaces, the angle of which in relation to the main surface which they balance being adjustable from the cockpit. 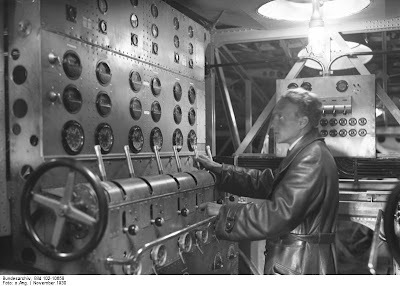 This setting is reported to be very easy, i.e., to require but very small forces, and the machine is stated to be as easy on the controls as are smaller aircraft. The power plant consists of 12 Siemens- Jupiter engines, arranged in six tandem pairs. 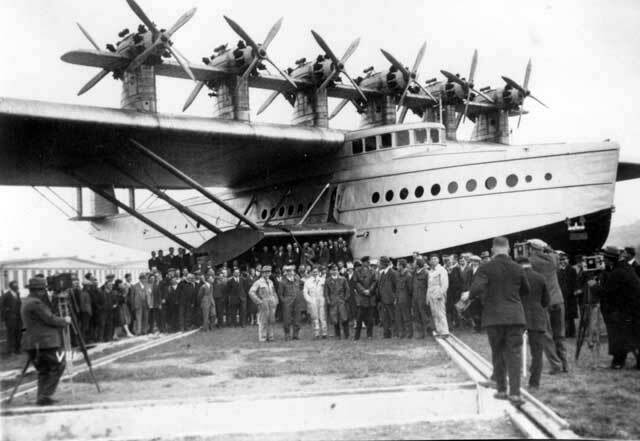 The large number of engines required forced, it is stated, this arrangement on the designers, and it is an arrangement the advantages and disadvantages of which are familiar to the Dornier designers from more than 10 years' experience. nacelles when the machine is at rest. and leading edge tanks are connected to a collector (sammelioPf). that the engine installation is remarkably free from vibration. average width of about 3 m. (10 ft.). be increased to 49-5 tons (109,000 lbs.). on an enterprise at so unearthly an hour? on the final stage of the Do.X's trip from New York. people would choose more agreeable hours for departure! visibility would doubtless improve shortly! large Air Force flying-boats moored alongside her. at 8.30, but this was impossible. On board we were met on the stub wing by Capt. an air liner on a transatlantic flight. end of its 15 months' sojourn away from its native hangar. there is not the slightest evidence of this anywhere. freshness and are none the worse for wear. vessel as she set out from Calshot for her Atlantic adventure. 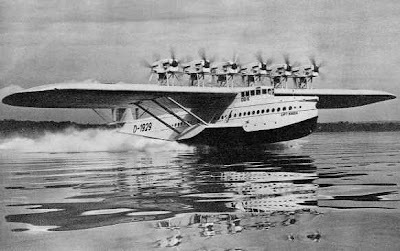 that of realising that it was an aircraft and not a seacrait. down in the car I had jokingly asked Dr.
experience of the trip they were then setting out on. came the cry, " All visitors ashore," and the many R.A.F. and therefore I am inviting you to accompany u s ."
Without hesitation I accepted his very sporting offer. been dug out at 4 o'clock that morning after all. that two enormous thermos pails sent up to the R.A.F. soon the ship was cruising at about eight to ten knots. suction holding the boat, it was backed off. object of flying high—it only wastes power and fuel. lap against the bottom of the boat. twelve 600-h.p. engines kick up a fiendish row. writing all our observations on scribbling pads. the fuel deck to make his regular round of inspection. Herr Ruhl, of the Deutsche Vacuum Oel, A.-G.
wants, there is literally nothing to do. comfortably and observe what is going on. marine engineer in its completeness and efficient lay-out. messages, which were accepted at the ordinary rates. same time, with all his good humour, keen and efficient. room for more than a few minutes at a time. spite of the veering winds and unpleasant weather. without spilling a drop throughout this 8J hours' flight. the Do.X sailed on in perfect steadiness. on and one hour off, and during part of the flight Capt. for over halt an hour. directions except straight back and directly overhead. to us by Fraulein Strassmann. the ship as she passed overhead. this height all the way to Berlin. these flocks fled to the port and starboard. in their terror to get away from the noise of the Do.X. from that of the average aircraft. As Berlin came in sight there was great joy on board. historic flights in aviation—I cordially agreed. Reichstag! We then turned east towards the Miiggelsee. Do.X, as witness the crowds and the stationary traffic. craft of every conceivable shape, size and kind. aeroplanes circling around us in welcome. moment of contact with the water. hour before we could disembark. respects to this wonder ship. Do.X flying boat (12 Curtiss " Conqueror "
afternoon of the same day. America was prolonged by various forms of unpleasantness. in America it were, perhaps, better to draw a discreet veil. cleared and it was possible for the Do.X to reach St.
John's and complete her refuelling there. bad weather, clouds and rain, and climbed to 1,500 ft.
to try to get above the rain. reached and entered safely and the machine moored. Water. By 7.30 she was ready to moor. An amazing machine! Thanks for posting this account. What a fantastic bit of history - and a charming account of it. Thank you! My grandfather was Clarence H. Schildhauer- I remember him telling me stories about flying the DO-X- How LOUD it was- A great piece of our family's history. The 1930 article is highly informative, but the England account is nothing short of a revelation. I've been researching the Do X for about ten years, and this is the best account, bar none, of what it was actually like to fly in her. Thans for sharing this with the internet!